Much of Europe has been plunged underwater as huge downpours hit the continent. Hundreds have been evacuated from homes in Pisa, Italy, as the city’s Arno river looks set to break its banks, and in Venice, tourists could only look on in flooded St Mark’s Square as it was enveloped in a yearly phenomenon known as ‘acqua alta’ (high water). 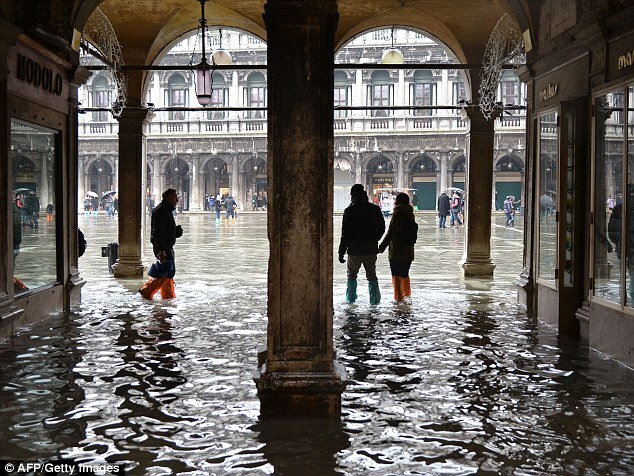 A third of Venice is already under water as an unrelenting wave of rain sweeps across Italy. The French department of Finistere has been placed on alert as forecasters warn of huge waves and widespread flooding and army and police have evacuated about 1,000 people from cars and buses stranded in deep snow in northern Serbia.